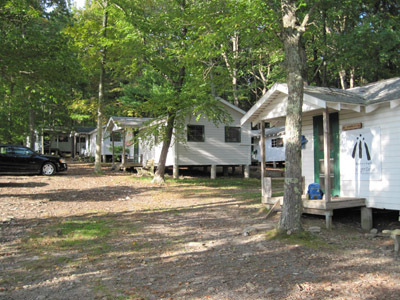 The camp which hosts the Gathering offers both tent areas and basic cabins. 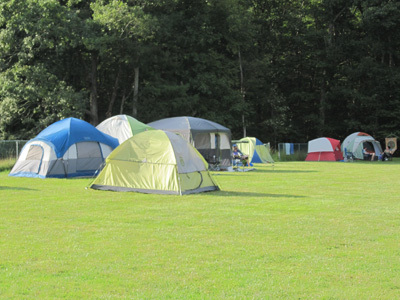 With more people attending this year than last, the ample space helped. 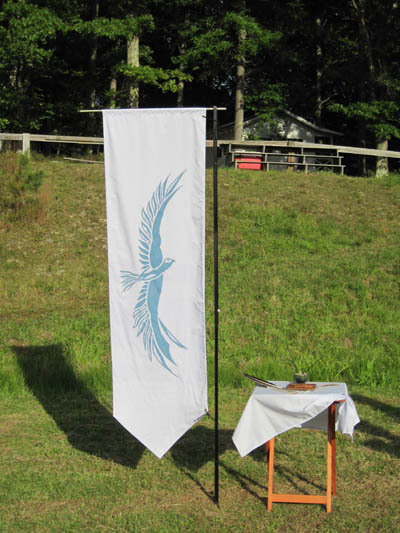 The area is splendid for large group rituals as well. 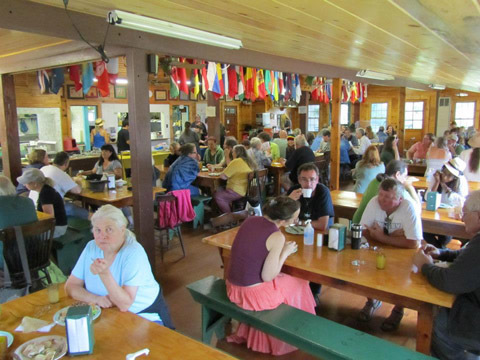 The rainstorm over the weekend brought with it cooler weather, which just made us all the more grateful for hot drinks and the varied meals our staff of Druid volunteers cooked for us. I didn’t arrive in time for the opening ritual. But the Closing was held on the same grounds, with the same altars. 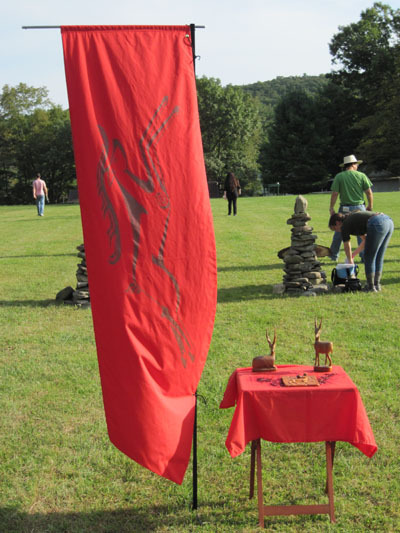 Here are shots of the two entry cairns seen looking south, along with the four directional altars and their banners: Stag of the South, Salmon of the West, Bear of the North and Hawk of the East. 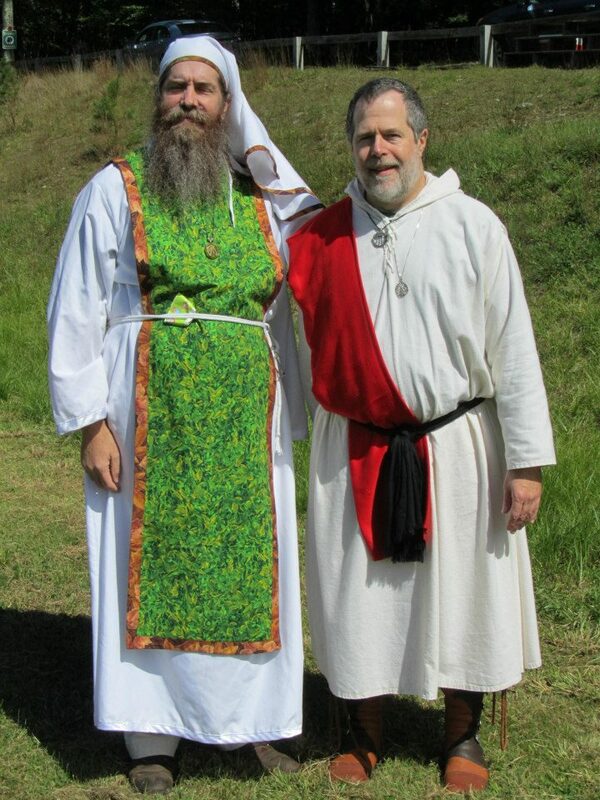 One of the added pleasures this year was the attendance of more Druids from different orders, including ADF. 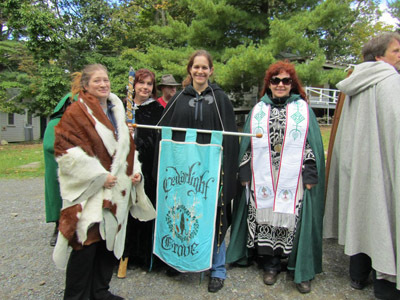 Here are members of Cedar Light Grove assembled around their grove banner (photo by John Beckett). OBOD groves brought banners too. 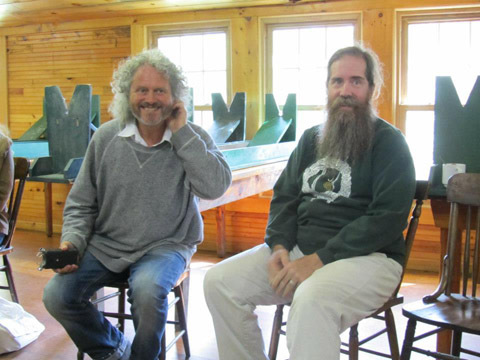 And this year, the third Gathering and my second, yet another draw was the chance to meet and learn from both OBOD’s Chosen Chief Philip Carr-Gomm, and AODA’s Archdruid John Michael Greer. 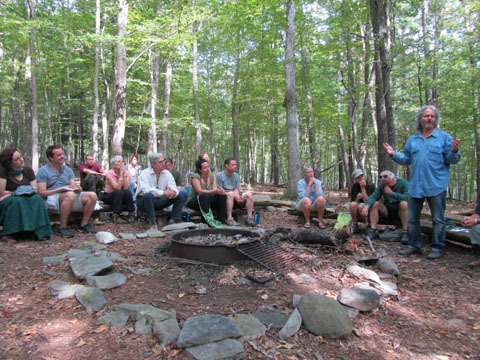 The first photo is of Philip giving a talk in Storyteller’s Grove a little north of camp. The second shows John Michael during one of his morning talks in the Pavilion. 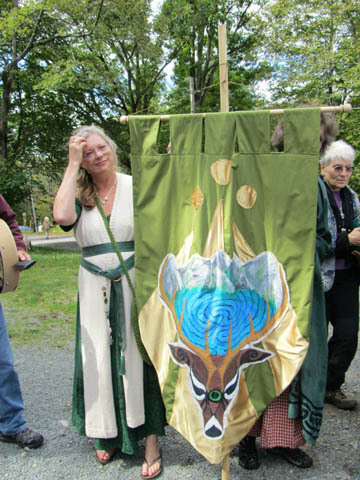 And of course no Druid gathering would feel complete without the ceremonial garb that makes the rituals visually distinctive and memorable. Topping off each day were the evening fire-circles and drumming, music and song and ample home-brewed mead, cyser and sack from our resident firekeeper and brewer, Derek. Then came the Hour of Recall, truly. The Closing ritual, goodbye hugs, departures, promises to keep in touch, to plan events, to meet again. 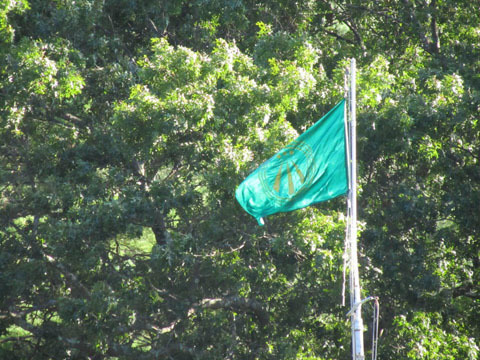 Another remarkable East Coast Gathering comes to an end, with opened hearts and subtle changes to take away and live through for the coming year. Till 2013! Thanks for this, particularly the pictures. They are rocket fuel for my inspiration to get there. Thanks for visiting and for your comment. 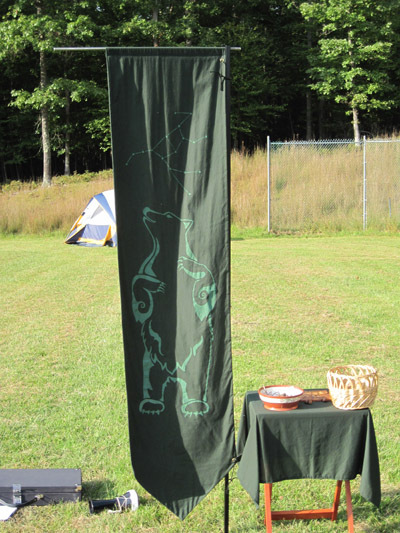 Yes, there were eisteddfodau every night — some wonderful talent, including Nico, a Druid from the Netherlands, one of our three European visitors. Plenty of stories and songs — the increased numbers of attendees this year seemed to double the pool of people who contributed a joke, story, song, dance, skit (we had a hilarious version of “The Brementown Musicians”). And the drumming was wonderful — we had a core of three very skilled drummers who inspired some lively dancing around the fire each night, even from people like me who “don’t dance.” Hope to see you there next year! Seems like an awesome experience – combined with your teaching starting up, it seems like your Autumn season is getting off to a great start! It WAS a remarkable experience. Nothing like running at full speed into doing after a time of reflecting. I’m still a little dizzy from it all. This all look so wonderful. My husband and I just started with OBOD in August and I hope there will be one of these next year that we can attend. WASP, thanks for your comment. 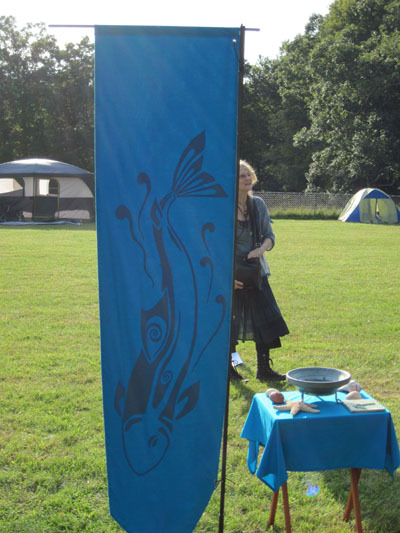 All best wishes with your Bardic studies and hope to see you both at a future Gathering. 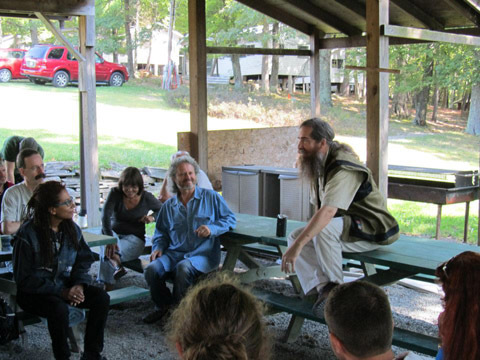 There’s nothing like spending a few days with fellow Druids in a beautiful setting. I’m already looking forward to next year. Thanks for the photo credits! to you who visit, explore or follow this blog: knowing you're reading and thinking about these things too helps me keep writing.